Learn with this feature which email clients were used to open your newsletters. Each device and email client displays a different email client. If you’d like to up your email marketing game, it is prudent to know which email clients are frequently used by your recipients. Thanks to advanced analytics tools offered by Newsletter2Go, you can easily track newsletter email clients. After your newsletter has been sent out, you will get a detailed email client report. Thanks to email client tracking you learn how many newsletters were opened on a desktop computer, smartphone or a tablet. As far as desktop opens are concerned, you will also receive a detailed email clients report. You will find out your how your subscribers access newsletters. They might use webmail or popular email clients like Apple Mail, Outlook, Thunderbird or others. 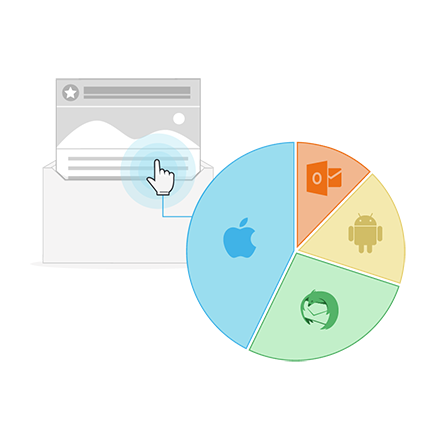 Such a report will help you determine which operating systems are common among your contacts. If you track email opens in email clients, you gain useful pieces of information that help you design great newsletters. The rendering can vary greatly from one client to another, so your newsletter might be displayed differently in every email client. This is why it’s recommendable to track newsletter email clients, so you can clearly identify which clients that are most popular among your readers. The advantage is clear: you will be able to tailor newsletter design to client requirements. It will also help you rule out certain email clients so that you don’t waste time adjusting email design especially for them. There is a growing number of people who open emails on mobile devices. This trend shows no signs of slowing down – quite on the contrary. If you’d like to see your newsletter being displayed correctly on every single device out there, you should use responsive design. Thanks to this feature, your email will always adapt automatically to the device on which the newsletter is opened. All Newsletter2Go templates are fully responsive. If you use our free or premium templates, you are on the safe side, knowing that your campaigns will always display perfectly. If you’d like to see how your newsletter is displayed in different email clients, Newsletter2Go’s got your back – we offer further email client testing. Thanks to this option, you will learn how your newsletter looks in different email clients before you even send it. All Newsletter2Go premium templates are tested by default in the most important email clients. Therefore, you can be sure that your newsletters will be displayed correctly. Le display problems be a thing of the past and concentrate on the most important thing – relevant content that converts. Is it possible to track links using your newsletter software? Is it possible to test Email Clients? Which Email Clients Do Your Customers Use?